TS DEECET 2018 is the Common Entrance Test conducted to grant admissions to the aspirants who desires to join in District Institutes of Education and Training (Diet cet 2018/DEECET 2018) or Elementary Teacher Training Institutes Common Entrance Test(ttc 2019).TS D.Ed (TTC) Exam 2018 Notification released in the month of March 2018. This Telangana State DEIT CET Notification is for students to rovideadmissions in TTC Course for the academic year 2018-19 through Department of School Education. The Government of Telangana publishes the TS DEECET Notification 2018 for the common entrance exam to get Admission for D.Ed with Two years Duration Course. Director of School Education in Telangana will release DIETCET Notification in April 2019. Willing candidates can check the TS DEECET 2019 Notification details such as Online Application Process, Eligibility, Important dates. Interested applicants can apply for the Telangana D.Ed (TTC) exam on Online Application Mode. Candidates must submit the Telangana DEITCET Online Applications on or before the last date . The DEECET Notification is for District Institutes of Education and Training (DIET) and Private D.Ed Colleges. Aspirants who are eagerly waiting to join in Diploma Education course in Telangana Institutes may apply for this Telangana DIETCET 2019 Exam. One can apply through Online on or before the Last Date Online applications available from 11-03-2019 to 04-04-2019 at the official website. The eligibility details given on our website is based on the Eligibility criteria according to the TS DEECET 2019 Notification. The Aspirants who appeared for 2nd-year Inter examination can also apply for TS DEECET 2019 Exam, but they should be passed at the time of admission to the course. Applicants need to satisfy the minimum eligibility criteria for TS DIETCET 2018 such as qualification, age limit, etc. 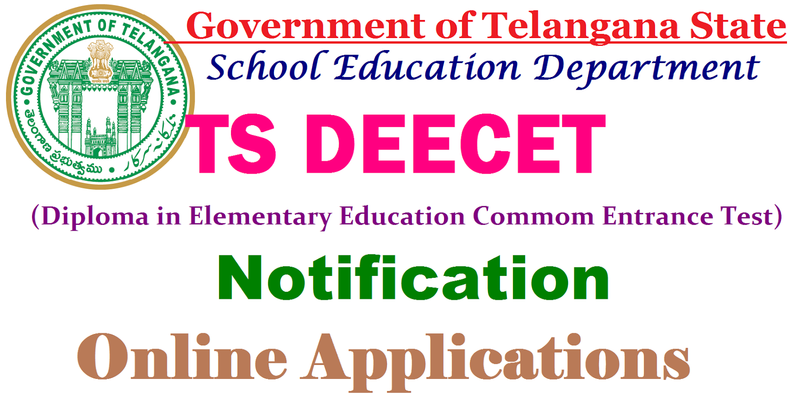 Eligible candidates can apply for Telangana Deecet Exam 2019 before the closing date. We have provided here the simple steps for the candidates to download and submit the online application form. Hey nice details... Plz provide me a direct link to download UP Police Sub Inspector Admit Card 2017. Very nice article that you have published on this page. Very nice article that you have published on this page Telangana Postal Results 2018.